Writing Empire — a full length novel on an archaic mobile device! I wrote Empire mostly on one of these while travelling in Southeast Asia, Australia and North and South America… still hard to believe. 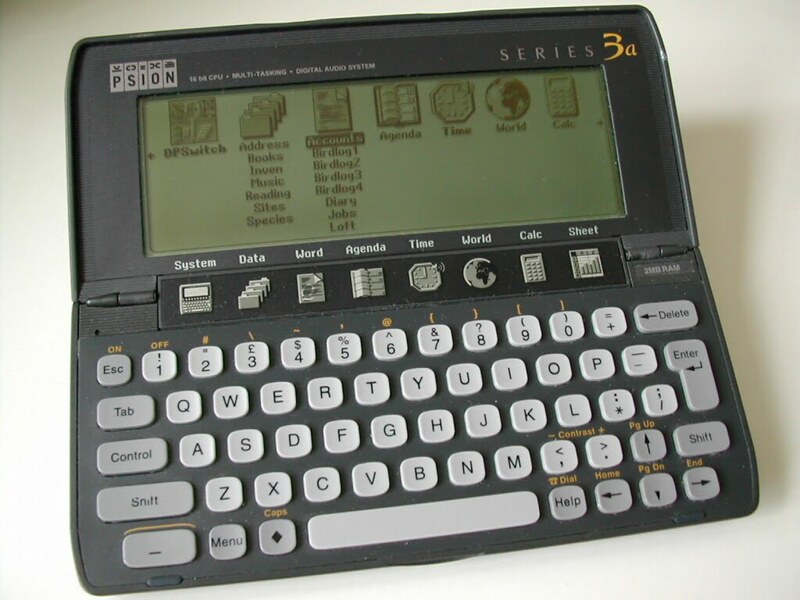 Do you remember the Psion series of personal organisers / palmtop computers. Back in the day before we all took internet access for granted, before Google was invented and email was still largely still an internal corporate phenomenon, Psion led the way in terms of truly portable productivity. I’ve always been a bit of a gadget geek, and in the late nineties I was the proud owner of a Psion Series 3a. Its specs are paltry compared to the latest incarnation of mobile devices, but in its day it was a very capable little machine — with everything you needed for productivity on-the-go. The word processor on these things was great… and the spreadsheet app and calendar worked like a charm. It was the ideal companion when, way back in 1998, my wife and I decided to leave promising corporate careers in Birmingham and head off on a round-the world adventure. The Psion ran on 2AA batteries, which thanks to its simple monochrome LCD display lasted for ages… so there was never a problem looking for a power outlet or sourcing replacement batteries. It just worked. I’ve always been a keen fantasy reader, so I started playing around on the Psion with a story about a half-elf orphan girl, and building a world around her quest to find out who she really was and where she belonged. For six months travelling through south east Asia I’d whip out the Psion whenever we had a spare moment and work on the story. Empire started to take shape between mountain treks in the north Thai province of Chiang Mai, exciting encounters with wild orangutans in the jungles of Malaysian Borneo and visiting the magnificent islands of Ha Long Bay in Vietnam. My fingers soon got used to the little keys and before long I was typing as quickly as I could on a full-size keyboard. The Psion was the perfect travel writing companion. Small, discreet, power efficient and functional enough to offer everything a writer needs, with none of the distractions incumbent in today’s connected devices. I found myself writing whenever I could… often long into the night… just to find out what happened next in the story. That’s right… it didn’t really know what was going to happen next. It’s hard to explain, but it felt like the characters where driving the story, I just had to be there to put the words down. Sounds nuts right? But that’s the way it worked. By the time we reached Sydney we were broke, so we both got jobs to top up the coffers. My beloved Psion was showing signs of wear and tear: the letters had faded off several of the keys, a couple of them were sticky and the poor thing had been opened and closed so many times that the ribbon connector was getting worn and the screen was flickering. So I upgraded to a second hand Psion 3c — identical form factor, but slightly higher spec. The writing continued… albeit at a much slower pace. There simply wasn’t as much freedom and time with work and other commitments. 10 great months later it was time to say our goodbyes to Sydney. We hit the road again, travelling around Oz before heading across the pacific via Fiji and Hawaii to Canada, the USA, Mexico and South America. I wrote a little most days, a lot some days during our 7 month trip back to the UK. By the time we reached my parents’ house in North Wales on the cusp of a new millennium Empire was finished. It’s still hard to believe I wrote it all on a Psion 3 series palmtop. The full book is available in e-book format for Amazon’s Kindle series of reading devices from Amazon.com, Amazon.co.uk or your local Amazon store.